In 1783 the German anatomist and physician, Dr. Johann Lieberkuhn, attached a concave polished silver mirror around a simple microscope objective lens. Light was thus reflected onto a solid object so that it was well illuminated from the eye side, till then virtually impossible, even though the idea had been around for approximately 100 years. Both the Lieberkuhn lens and the instrument’s portability enhanced the use of the microscope for botanical field work. The object is held with forceps which inserts into a brass fitting on the hinged compass arm. The forceps is turned by an L-shaped brass handle. The body, consisting of a brass circular ring, is mounted on a curved brass arm 3" long. A brass eyepiece, coated black on the eye side, screws into the circular ring. Four Lieberkuhn lenses screw into the eyepiece. Each lens is matched in focal length with its coin silver concave mirror. Fine focusing is achieved by turning the knurled knob to adjust the distance between the compass arms. 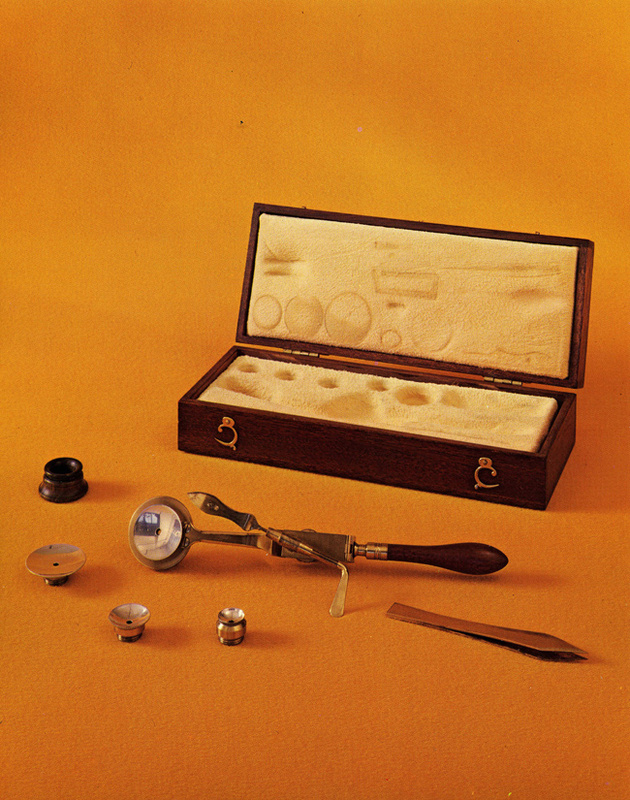 Accessories include a hand magnifying lens, in a lignum vitae mount, and brass tweezers. The rectangular mahogany case, 7 1/2" L x 2 7/8" W x 1 11/16" H, is fitted and lined in chamois leather. Overall length with handle is 6 3/4". The Replica Rara stamp and serial number is located on the inside surface of the hinged compass arm.